Re: 1013: "I made this"
Eternal Density wrote: In other news, I now own a titanium spork. ChronosDragon wrote: Anyone else up for a rehatting, just while I've got photoshop open? I'm in dire need for a lightning rod. Decree: figure out the reference in the subject and reference it. Last edited by AluisioASG on Sun Mar 02, 2014 11:38 pm UTC, edited 1 time in total. Aluisio what's wrong with my spork-ownership? I guess it means now I can buy and eat a tub of icecream if I want to. That could be bad. Just remembered I never saw the latest OtherComic. So that's where that transformers comic came from. 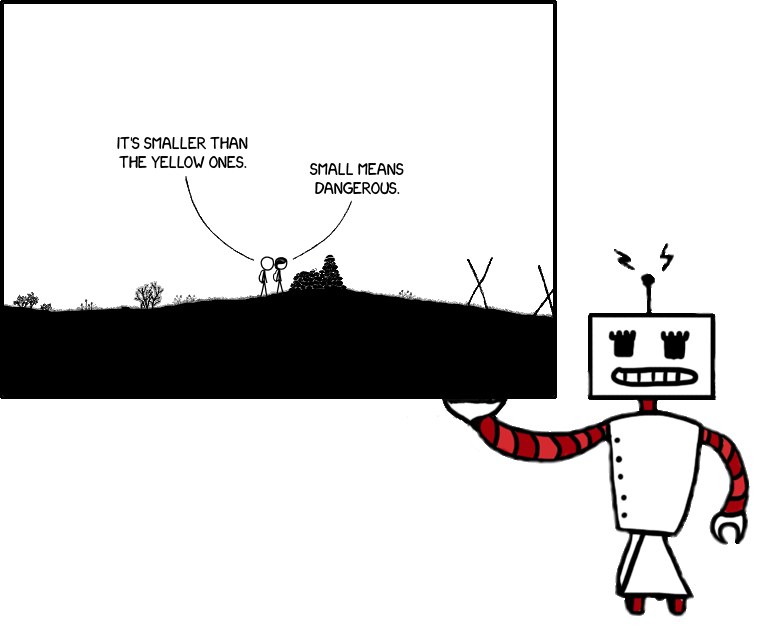 It didn't look like the regular xkcd style. Eternal Density wrote: Aluisio what's wrong with my spork-ownership? As dashing as you look, CD, my buffyhat isn't going anywhere. mhhmm. I only swup out my buffy hat for seasonal headgear, and it always comes right back after. Splendid new hat, ChronosDragon. To think, a habadasher without a hat of their own - what had this thread come to! But all is back to the way it should be. Jolly good show. That's fair. But as a limited­µ time offer, I'll redraw your buffyhat in HD, to add to a gif or collection! Or hat your buffyhat! µ Offer only lasts until the heat-death of the universe. Act now! I'm on np 1349. The second set of OTTer-created ONGs (the POTM series) has started. Thank Randall I knew about the fora! How long has the link been gone now? How much crazier would the OTT have been if it were easier to find? Shared his OTT blitz eperience with my best lady. Let me say one more time thank you to this community for being what GLR knew you would be. BlitzGirl's poem on rhyme scheme EDBA DE CBCB DCAE CD BABABA DC, another of a series based on the Epilogue sequence. ... and a tune by @ucim based on the Epilogue sequence. BlitzGirl discovered that The GLR fixed mustard in 2006H. Acts of the Clerics, Scene 22. BlitzRocket crash-lands amidst the Pillars of Hercules, and a dramatic rescue! End of Days: The Beginning is the End: Another installment by @AluisioASG of a series with Memento-esque storytelling. I am tempted to make a bot that matches the OSH against all 3099 frames, but that's sorta cheating. But I guessed this OSH with no bots and without even looking at any frames! If I could go back in Hreal time to send ice cream back in OTTTime, I'd share some of my ice cream with him. @Exodies reports from 1225/1338; sees his own post from NP555: Note to self: Don't post around ONG-time, for fear you may see the ONG. Oh well. and @macraw83 is at 868/1339. All are pre-Voldeframe... We're going to need a bigger truck. np 1337: SPONTANEOUS LEETSPEAK INTERLUDE. 50, 17 h45 c0m3 70 7h15. One More Time7 It's techno, and I love it! Thanks @Eternal Density! Othercomic is up at newpix 3363.61, And allready OTTified... by @waveney at newpix 3363.78, probably a new record for the fastest OTTification. In the Future, will you OTTify them before Randall decides to draw them? But are there still mustarded frames in Time? I think this one still has some mustard in the text: M3019 where Buzz wrote: "....I said we should to move to the hills, ..."
I agree, a serendipitous discovery. As of now, 5000 newpix later, frame m3019 still has that mustard. And Acts of the Clerics, part XXIII, done mostly in Double-Dactyls and haiku, with worthy Monty Python references. Yeah, the new letters you want are F, G, H, I, J.... Wouldn't it be treeish if we got that! ... and I think I am passing between you and @balthasar_s, which might affect the appearance of this blitzreport. and that was after the bots and I spent a couple dix digging around in various equipment rooms catching bugmolpies. mrob27 wrote: azule - Loved the latest "Dark Lord". czule wrote: Well done. It could so easily be an OTTification by changing the 'm' to a 'q'. Last edited by mrob27 on Mon Mar 03, 2014 2:52 am UTC, edited 3 times in total. Whatever happened to "Never cross the streams!" 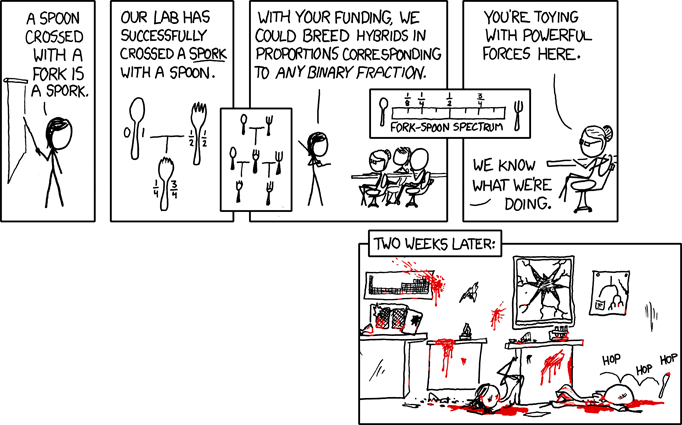 Don't worry, my spork was carefully bred for sterility. What happens if I put “with” after that sentence? I don't know how useful is a spork you can't bread. ucim wrote: azule - Loved the latest "Dark Lord". Do we now know where Middle Earth is? ... despite that I never wrote Loved the latest "Dark Lord". The fact that the Dark Lord installment was actually by Earthing on Mars constitutes another error. It would be up to somebody in the Present to realize that and correct @ucim on that misattribution. AluisioASG wrote: I don't know how useful is a spork you can't bread. Not bread. Knives are for bread. An OtherComic OTTified before it even comes out! That's some truly excellent temporal shenanigans! Since mrob suggested it, I just had to. And since 1337 is next, it was a great chance to do something which looks like it could really be the next OtherComic. Eternal Density wrote: Since mrob suggested it, I just had to. 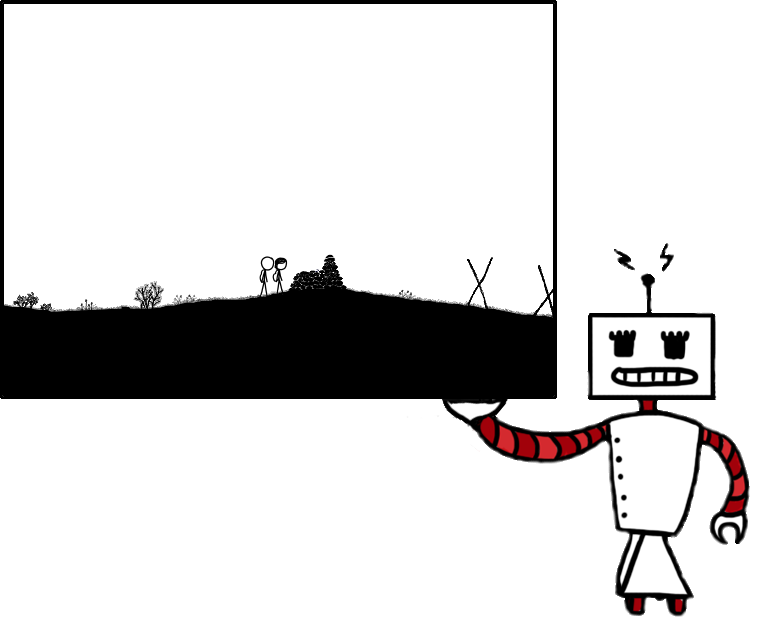 And since 1337 is next, it was a great chance to do something which looks like it could really be the next OtherComic. If it is the next OtherComic, you are now Randall. You don't have a choice in the matter. LLOL! This forum has me actually laughing out loud more than any other thing I do on the net. And should I be concerned that an image of sketched ants on photographed doughnuts is readily available on the internet and doesn't have to be constructed? It's a weird world out there! I also seem to be the host of brainmustard. Dark Lord, which I enjoyed thoroughly, is from Earthling on Mars. However, I had azule on the brain because of his (or her?) recent (treeish) Zanclean Zodiac. And maybe because of other things that only a hotdog condiment would know. There is no conspiracy at all, just keep on going, nothing to see here. You see, if I don't respond to something I like soon enough (because I'm probably reading in "can't reply now" or "can't play sounds now" mode), the probability of mustard increases, and since I don't hotdog much, there's no place for it to go except back into the OTT. Mustard can only be created, and not destroyed. Any attempt at destroying mustard will only end up in the creation of more mustard, somewhere else. Or sometimes, not somewhere else! Of course, mrob27 probably won't see this.... er.... oops! Crenellation is an actual word which means to put all the little crenellations into a sandcastle, to make it look like a real castle, which has actual crenellations. Etymologically, it relates to "cranny" (a nook, or notch, in which something treeish might be kept). I'd like to think that it shares roots with "crown" (headgear which often is crennelated) but it appears not to have a direct connection. Oh, if people wanted to give me money, I'm not sure I would turn it down. I tried to make money in the stock market; now I make money in the basement! No, not that basement. I'm not there. I've never even visited! Really! I don't know anything about all that ink. Shipping is my business. And dropping. And railroading. The obvious response to the decree is "mustard". I certainly made this! AluisioASG wrote: Midpage decree: ships. Re: 1013: "The (Sand-)Castle Files"
Is it normal to see double helices everywhere in that picture? AluisioASG wrote: Is it normal to see double helices everywhere in that picture? No, you should also see a single helix. The picture was actually taken on the high seas, they photoshopped it onto a plain white background to make it more believable. ChronosDragon wrote: The picture was actually taken on the high seas, they photoshopped it onto a plain white background to make it more believable. Why does no-one ever sail the low seas? What Time do OtherComics usually go up? I feel as if the answer is inevitably going to be "5 minutes after I molpy down". In which case, it will be in about five minutes. HES wrote: What Time do OtherComics usually go up? I feel as if the answer is inevitably going to be "5 minutes after I molpy down". Roughly three nopix ago. They've been a bit late recently. Be right back - riverish ketchup Time. Yappobiscuits, we have a new challenge for you to sing! Oh ch*rp, is that a scorpion that Cuegan is looking at? What a handsome hat, ChronosDragon! Quite dapper. Eternal Density wrote: Don't worry, my spork was carefully bred for sterility. I hereby declare Eternal Density to be Time Traveller of NP 1778. Not only did he give us an OTThercomic4 before the OtherComic appeared, he also posted this half a nopix before the next SilentONG appeared. However, there might have been some sneaky newpixbot-ninja-editing involved. There is some cutlery you don't want to cross.